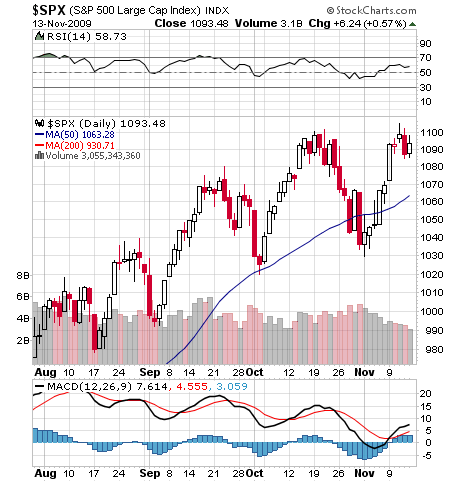 Nov 13, 2009: markets topping-out again? Just two weeks ago, in this place, I wrote about the signs of a market intermediate bottom. Getting long again, or overweighting long positions around that time turned out to be the right thing to do. It took much less than I thought it would, and here we are again near new highs on the major US stock indexes. After a very rocky and volatile bottom, the market has handed "buy and holders" back 5-6% (on the S&P500) in essentially 5 trading days. All that volatility for just breaking even. Intermediate-term traders did much better. Those who exited around the mid October top (note that the exact day of the trade is less important than simply being cautious around the top), and reentered two weeks ago (in the 4 days around Nov 1st) are now sitting comfy with their portfolios 5-6% above their prior record highs. Personally, I got back into a defensive (neutral to very slightly bearish) posture during the spikes of last Wednesday and Thursday morning. Why? Take a look at the following daily candle-stick chart of the past ~75 trading days (about 3.5 months) in the S&P500 index from stockcharts.com. The great similarity in the general shape and time frames from peaks to bottoms of the past 3-4 peaks. The bumps have been making less and less impressive new highs with a failure to make a significant new high during the last jump. The corrections (down movements) are getting more and more sudden and violent. The most recent tiny down-leg already has 3 consecutive days of lower-highs and 2 out of 3 days of lower-lows. So why not simply short the markets here? The reason for not getting "strongly" bearish at these tops is that we are, after all, in a bull market. It is not prudent to go 100% short in a bull market. What one should do instead is lighten up on long positions, increase hedged and pair-trade positions, and generally emphasize preservation of capital. Or to reverse the logic: getting 100% long at tops is a sure way to under-perform. The most alarming sign is something I haven't seen in prior intermediate peaks: this peak is much narrower (less stocks making new highs) and there's a clear break down in small-cap stocks and financials. Here's a chart of the small cap 600 index, for the same period. Notice how the small caps have not just failed to make a new high with the market, 2 trading days ago, but also how much lower their most recent high was compared to their prior, mid October, one. 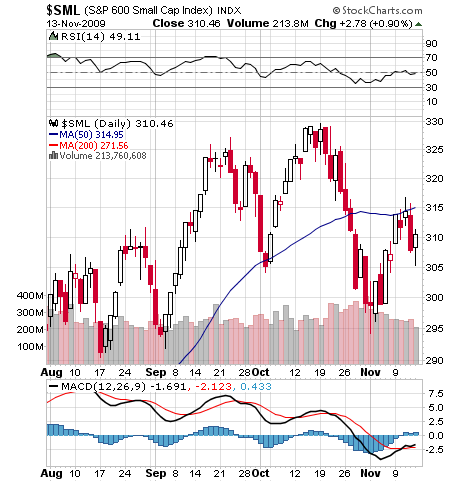 And look at the MACD (moving average convergence/divergence) lines making lower highs and crossing into negative territory. This is not warm-and-fuzzy feeling material, and it shouldn't be ignored. My best idea right now is a pair trade: go long QQQQ (large cap growth with technology overweight), and go short IWN, IWM, IWC (small and micro caps with emphasis on value). The idea is if the divergence continues, it would do well regardless of whether the markets tank or go ahead and make yet another new high. If the divergence fails, not much harm would be done because we would be mostly market-neutral with this long/short trade. Note that this is an intermediate-term outlook. A few days to a few weeks. If the market tanks significantly (5% or more on the SPY, and 10% in small caps) I would be covering the short half to realize gains. If on the other hand the market and small-caps shoot up sharply, I would be increasing my short position in small caps to take advantage of the spike.